Fig. 1: Biological and cellular functions of NAD+/NADH and NADP+/NADPH, modified from Ying(1). (AR = ADP-ribose, G6PDH = glucose-6-phosphate dehydrogenase, 6GPDH = 6-glyconate phosphate dehydrogenase). Nicotinamide Adenine Dinucleotide (NAD+), reduced nicotinamide adenine dinucleotide (NADH), nicotinamide adenine dinucleotide phosphate (NADP+) and reduced nicotinamide adenine dinucleotide phosphate (NADPH) have been known to play vital roles in energy metabolism, antioxidation, and reductive biosynthesis. In recent years, these co-factors have been shown to be involved in other physiological functions as well, including aging, oxidative stress, intracellular calcium homeostasis, ROS production, cell death and gene expression (Figure 1) (1). In this application note we show the use of BMG LABTECH’s Omega microplate readers equipped with a UV/Vis absorbance spectrometer for NAD+/NADH or NADP+/NADPH measurements. 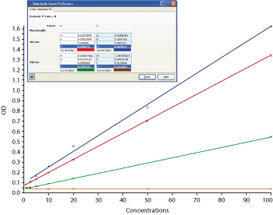 The easy-to-use data analysis software, MARS, allows for fast determination of co-factor dependent enzymatic activity. UV Transparent 96 and 384 well Corning microplates (Cat #3635 and #3675). Fig. 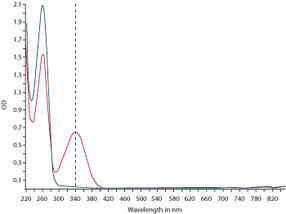 2: Absorbance spectra of NAD+ (blue line) and NADH (red line). A final volume of 300 µl was used for 96-well plates and 100 µl was used for 384 well plates. Concentration dilution curves were made for NADH and NADPH (0.625 - 100 µM). A faux NADPH to NADP+ conversion curve was set up using a constant nicotinamide adenine dinucleotide concentration (NADP+/NADPH in mM: 150/0, 130/20, 100/50, 80/70, 70/80, 50/100, 20/130 and 0/150). Spectra were taken from 220-450 nm for NADH and 220-650 nm for NADPH using different number of flashes (20, 50 or 100). 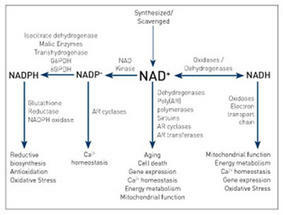 Changes in NADH to NAD+ or NADPH to NADP+ can be monitored using absorbance spectroscopy. NADH and NADPH absorb light at 340 nm, where as NAD+ and NADP+ do not (Figure 2). Fig. 3: Absorbance measurements (220-450 nm) of varying concentrations of NAD+ and NADH. Enzymatic curves can be easily done that monitor the absorbance change in NADH in any given system. 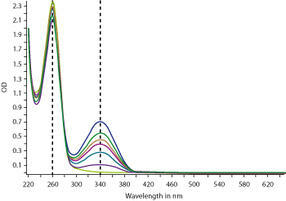 Overlaid NADH absorbance spectra show changes at two wavelengths, 260 and 340 nm (Figure 3). Fig. 4: Linear regression fit of NAD+ and NADH absorbance measurements taken at 260 and 340 nm (Fig. 3). NAD+ at 260 nm is the blue line and at 340 the brown; NADH at 260 nm is the red line and at 340 the green. Using MARS evaluation software, linear regression fits were done at two peak wavelengths, 260 and 340 nm. (Figure 4). Note a slope at 340 nm for NADH (green line), but not for NAD+ (brown line). The 260 nm slope can be used to monitor and to normalize for changes in the concentration of NADH (red line) or NAD+ (blue line). Fig. 5: Absorbance measurements (220-650 nm) of a faux curve for NADP+ to NADPH conversion (0-150 µM). Enzymatic curves can be done to monitor the absorbance change of NADPH in any given system. A faux conversion curve of NADP+ to NADPH was produced, keeping the total concentration of dinucleotide constant at 150 µM (Figure 5). 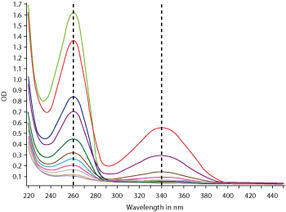 Changes in the absorbance spectrum can be seen at two wavelengths, 260 and 340 nm. Fig. 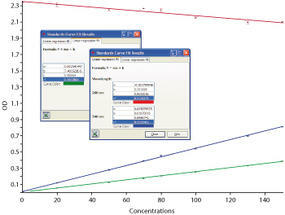 6: Linear regression fit of absorbance measurements taken at 260 and 340 nm for a faux NADP+/NADPH conversion curve (Fig. 5). The red line is the fit of the measurements taken at 260 nm, the blue line at 340 nm and the green line the ratio of the measurements taken at 340/260 nm. Using the MARS evaulation software, linear regression fits of the measurements taken at 260 and 340 nm were done for the NADP+/NADPH conversion curve (Figure 6). As expected, there was a linear increase in signal at 340 nm with an increase in NADPH concentration (blue line, R2=0.99). However unlike the fit of a usual dose response curve (Figure 4), the linear regression fit at 260 nm showed a slight decrease in signal as the NADPH concentration increased (red line, R2=0.93). Theoretically, this peak should have no slope since the concentration of the dinucleotide is kept constant. However, there may be a slight decrease because it seems that NAD+ absorbs more light at 260 nm than NADH (on Figure 2 compare the 260 nm peaks which have equal concentrations of NAD and NADH). A linear regression fit of the ratioed measurements (340/260 nm) (green line) can be done to correct for this change. Table 1: LODs of NADH and NADPH in 96 and 384 well plates using 20, 50 and 100 flashes. where the slope is taken from the linear regression fit of the 340 nm absorbance measurements on the NADH and NADPH standard curves (Figure 4 and 6), and the number of blanks measured were 15 or greater. The FLUOstar, POLARstar and SPECTROstar Omega microplate readers all have a UV/Vis spectrometer that can measure any absorbance range from 220-850 nm at 1, 2, 5 and 10 nm resolution in under 1 second per well. With this flexibility and speed, absorbance assays can be performed on the Omega that have never been done before on a multidetection microplate reader. Here we show the power of the spectrometer in measuring the cofactors NAD+, NADH, NADP+ and NADPH. 1. 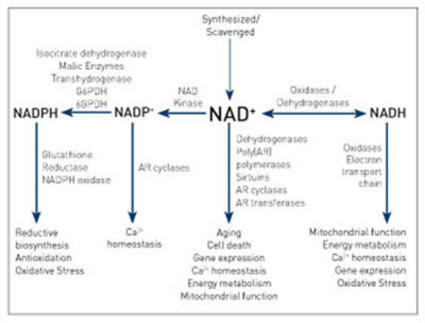 Ying W. (2008) NAD+/NADH and NADP+/NADPH in cellular functions and cell death: regulation and biological consequences. Antioxidants & Redox Signaling. 10(2), 179-206.